Key questions addressed in the book are: How has the SE been implemented in practice? How great has the uptake of the European Company by the business community been? Are there significant differences between countries and sectors? What impact has the European Company had on business practice? Has it improved company mobility and flexibility? What impact has it had on national industrial relations systems and Social Europe? To what extent has it inspired other legislative initiatives by the EU Commission? 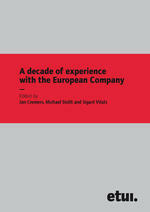 What will the likely future development of the European Company be?